It's that time again! At the moment every time a new month starts I am instantly planning my trip to Tesco to pick up the new editions of the monthly mags and the freebies that come with them! So here's a round up of what freebies to look out for in July with the August editions. Marie Claire comes out on 4th July with a free Eyeko Skinny Mini Liquid Eyeliner in Black worth £8.00. Marie Claire costs £3.80, which is a £4.20 saving. 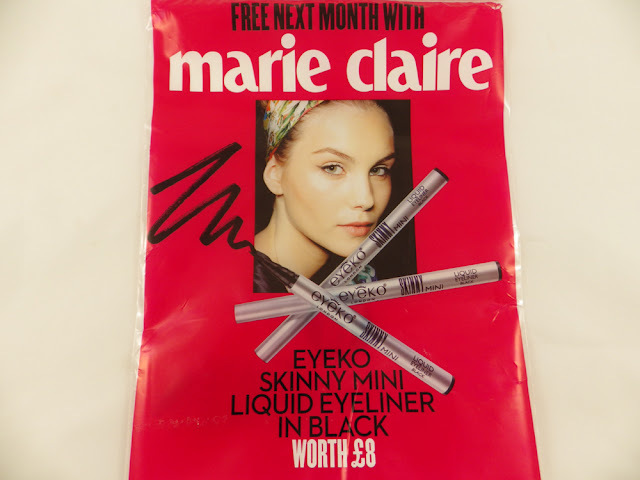 I really will be tempted to pick this one up as I love liquid eyeliners with the felt tip style nib, plus I've never tried anything by Eyeko before. UPDATE: I picked up Marie Claire for a bargain £2.50 from a local newsagent! 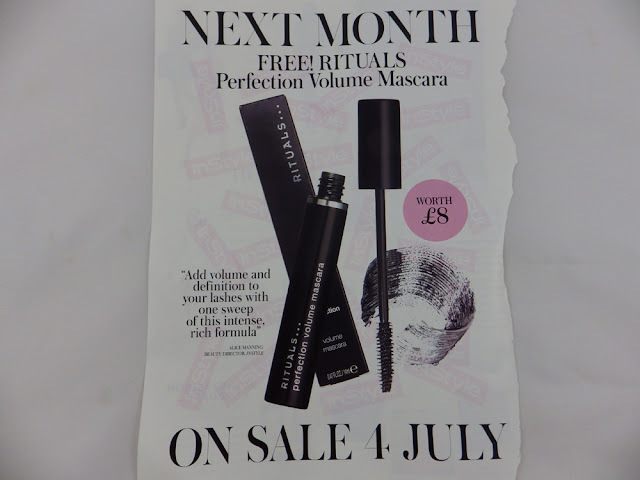 Also on 4th July, Instyle will be released with a free Rituals Perfection Volume Mascara worth £8.00. I have quite a few mascaras on the go at the moment, so I think I'll wait to read a few reviews before deciding whether to add this to my collection. Instyle costs £3.90, so this equals a £4.10 saving with the mascara too. If you like REN skincare, then Red will be the magazine to get your hands on. On 3rd July it will be released with a free REN 3 piece holiday skincare set. According to the website Money Saving Expert, this will consist of a Vita-mineral Day Cream 10ml, Rose Centifolia Cleansing Gel 15ml, Frankincense Revitalising Night Cream 3ml. Red magazine will set you back £4.00. I still have an unused REN freebie from last year's set, but I expect I won't be able to resist this! The freebies I am most excited about come with Glamour, out on 8th July (thank you again to Sara from Pretty in Pink for instagramming a picture). There will be a choice of four Balance Me products - a Super Toning Body Wash 100ml worth £9.00, Pure Skin Face Wash 50ml worth £11.00, Moisture Rich Face Cream 20ml worth £13.00 and a Shine On Tinted Lip Salve 10ml worth £12.00. Since Glamour only costs £2.00, I will be trying to get my hands on all four of these! Since publishing this post I have also seen that Cosmopolitan have a choice of three Nip and Fab freebies - Dry Leg Fix, Bust Fix and 365 Body Glow Fix. Cosmopolitan costs £3.60. Harper's Bazaar is giving away a mini pot of L'Occitane Immortelle Precious Cream, worth £15.00. Harper's Bazaar costs £4.20, so this is a huge saving! Will you be picking up any of these magazines this month? If you know of any others please comment below and I'll add it to the post with a credit! I'm going to have to keep instagramming Glamour for you :P haha! I was really hoping glamour was going to do a benefit free gift for summer! I can't wait for the balance me stuff and REN skincare! They all sound amazing and I know for a fact I will be picking them up when I see them!